Here's something fun that I was playing around with recently when dealing with regiments of the form xoo..ox, i.e. hexagon (hig for short), co, spid, scad, etc. I call them pizza graphs, they can be used to represent any member of the regiments mentioned. 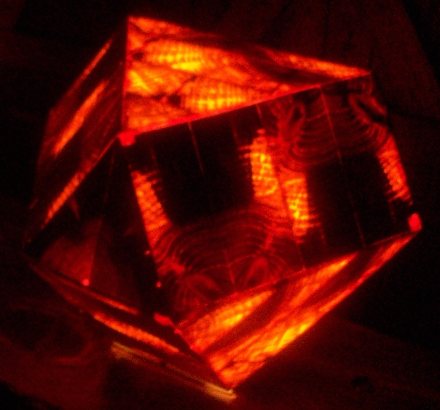 Pictured above is a glowing wooden model, called a "knotbox", of the rhombitetratetrahedon, a semi-uniform variant of co. My brother Jeff, who has made several knotboxes, built it after I supplied the design for it. He called this shape "the Jewel", so I call regiments of the sort xooo....oooy and their uniform variants xooo...ooox "jewel regiments". Jewel regiments have an interesting property. All possible facet regiments are either jewels of the previous dimension or are of the form AB (cross product of A and B), where A is the n-simplex and B is the m-simplex and where m+n=d-1, and m,n go from 0 to d-1 for a d-dimensional jewel regiment. 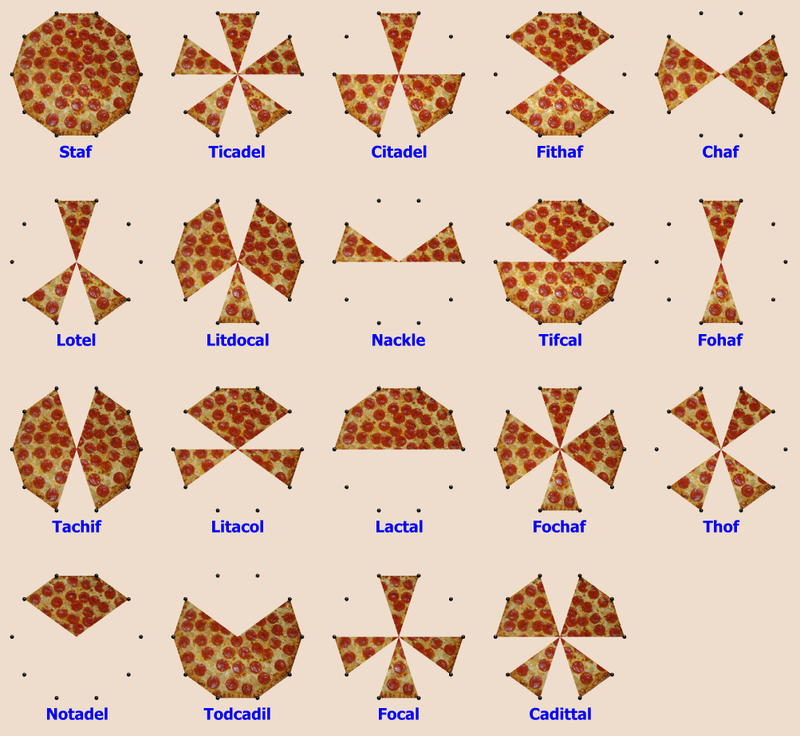 Each member of these regiments can be represented with "pizza graphs", where the top and bottom slices are two different sets of simplex facets, and the other slices which pair up (for the graphs have mirror symmetry) represents the other AB type facets. 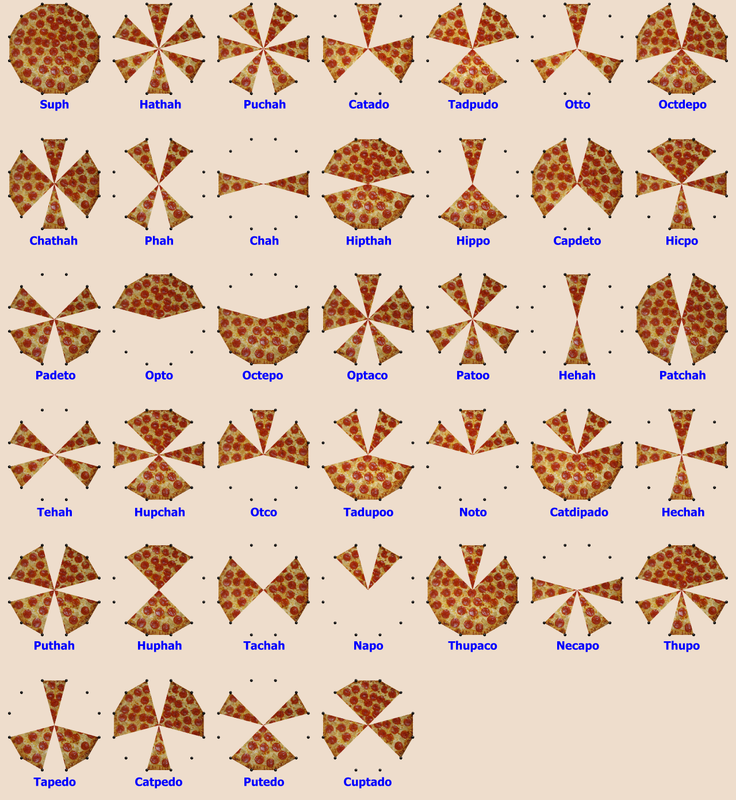 The cut marks in the pizza graphs represent the slices of the pizza graph of the previous dimension which generate a particular regiment member. Other regiments with a simplex antipodium or podium verf have similar verf topology and are therefore "pizza-graphable" as well as the cross polytopes which look like the verfs of the jewels, but squashed a bit, but most of their "regiment" are not uniform. Below are pizza graphs from 7-D to 2-D, note that the number of pizza slices = 2*(d-1). The slices (facet groups) are labeled in black and the cut mark locations (ridges) are labeled in red. Take scad for example (the 5-D case above), it has slices 04, 13, 22, 31, and 40 - these represent 0-simplex x 4-simplex = point x pen = pen, 1-simplex x 3-simplex = dyad x tet = tepe, 2-simplex x 2-simplex = trig x trig = triddip, 3-simplex x 1-simplex = tet x dyad = tepe (set 2), and 4-simplex x 0-simplex = pen x point = pen (set 2). There are no cut marks in scad, so it has no facets from the spid regiment. Now lets look at the graphs below. Hicpo is from the 7-D jewel regiment (the suph regiment - aka xooooox), its pizza graph has the following slices: 06, 15, 33, and 60 which represents the facets - 6-simplex (hop), dyad x 5-simplex (hix prism = hixip), tet x tet = tetdip, and a second set of hops. The cut marks are at 14, 23, 32, and 50 - now find a pizza graph from the 6-D cases with slices 14, 23, 32, and 50 - this is litdocal. Litdocal has the following facets: 14 - penp (pen prism), 23 - tratet (trig x tet), 32 - tratet (set 2), and 50 - hix. It also has dacox as a facet set due to the cut marks (04, 31, and 40). Now dacox has these sets of facets: 04 - pen, 31 - tepe, and 40 - pen, as well as piphid (from the cut marks 03 and 21). Piphid has these sets of cells: 03 - tets, 21 - trips, and coes (cut marks 02, 11, and 20). Co has 02 - trigs (triangles), 11 - squares, and 20 - trigs and has no cut marks, so there are no higs in it. We could do this in reverse to get pizza graphs for higher dimensions, use the slices and convert them to cut marks and generate one of the two possible graphs using those cuts. If the two graphs are vertical mirror images of each other, they will represent the same polytope, but in different orientations. However in the semi-uniform version as well as the non-jewel pizza-graphable regiments, like sirco and sidpith, they would be different. 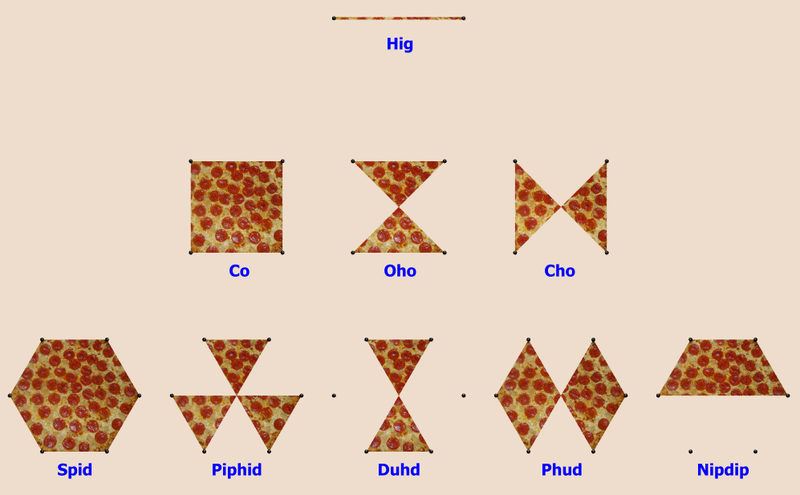 Example flipping the piphid pizza graph upside down will give the pizza graph of piphid in a different orientation, but if you were representing the sidpith regiment instead of the spid regiment, the pizza graphs would be of stefacoth and shafipto, depending on if it was right side up or upside down. Here are the pizza graphs of hig, the co regiment and the spid regiment. The pizza graph of hig (hexagon) has two infinitely thin slices, this graph will also work for any regular or semiuniform polygon with an even number of sides. The pizza graph of co has 4 slices, it can also be used for sirco, gocco, srid, raded, gidditdid, siid, and gaddid. The pizza graph for spid has 6 sides, the spid regiment graphs can also be used for the following regiments: sidpith, gittith, sidpixhi, siddapady, sadixady, gixhidy, gidthixhi, gixhihy, shihix, and rit. We can also use these graphs to represent the oct regiment, since the verf of spid looks like a stretched oct, but the only uniform members will be based off of the graphs of spid and piphid. These are the pizza graphs of the scad regiment, scad's symbol is xooox. These graphs are based on an 8 sliced pizza. These can also be used for the following regiments: scant - xooo'x, ginnont - oo(o'x"x), and rin - ooox'o. The hex regiment can be represented also, due to scad's verf being a stretched hex, but only the first three lead to uniform results, dibhid and chad will both represent tho in the hex regiment, but in different orientations. BTW, Dibhid is pronounced like DIV vid - note ph sounds like f, so I imagine bh should sound like v.
Here are the pizza graphs of the staf regiment, staf's symbol is xoooox. These graphs are based on a ten sliced pizza. These graphs can also be used by the following regiments: rax - oooox'o, stoxog - xoooo'x, and goxaxog - ooo(o'x"x). The tac regiment (5-D cross polytope) can also be represented here, but this time uniform members take on more graphs: staf (for tac), ticadel (for hehad), fithaf (for phap), and chaf (for nophap). Here are the pizza graphs of the suph regiment - xooooox. They are based off of a 12 slice pizza. These can also be used by the following regiments: rasa - ooooox'o, suposaz - xooooo'x, and gososaz - oooo(o'x"x). The gee regiment (6-D cross polytope) can also be represented here by the following graphs: suph (for gee), hathah and puchah (for two different orientations of thox), chathah (for heyap), phah (for henap), chah (for nohehap), and hipthah (for hehap). So . . . who's hungry for Chinese?